Return to Economics Internet Library 2/28/19 Please link to, use to educate, Share! A. Satisfaction received and limited budgets determine consumer demand. B. Utility measures the want-satisfying power of a good or service. a consumer receives from acquiring one additional unit of a product. within a given period will at some point result in diminishing marginal utility. 2. 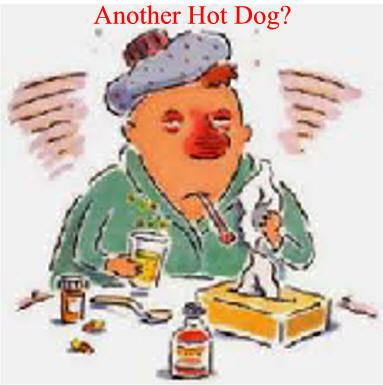 A person can eat only so many hot dogs before they get sick. 3. A potato chip company had an ad that said "I bet you can't eat one." The idea was that utility went up and you had to eat more than one chip. 5. Educating the Class of 2034 applies diminishing utility theory to education. E. Utility affects the law of demand. unless price is lowered (law of demand). F. Marginal utility - Wiki has more info. G. The Theory of Consumer Choice 53 mi. in diminishing satisfaction measured as marginal utility. A. All goods are purchased at an equilibrium price. life for which they have no diminishing utility. Do you know anyone? What was the product? minus the total amount that they actually do pay. When spending a limited amount of money, consumers equate the marginal utility per dollar for the items being purchase. More on Economic surplus from Wikipedia, the free encyclopedia. The term surplus is used in economics for several situations. The consumer surplus (sometimes named consumer's surplus or consumers' surplus) is the amount that consumers benefit by being able to purchase a product for a price that is less than they would be willing to pay. 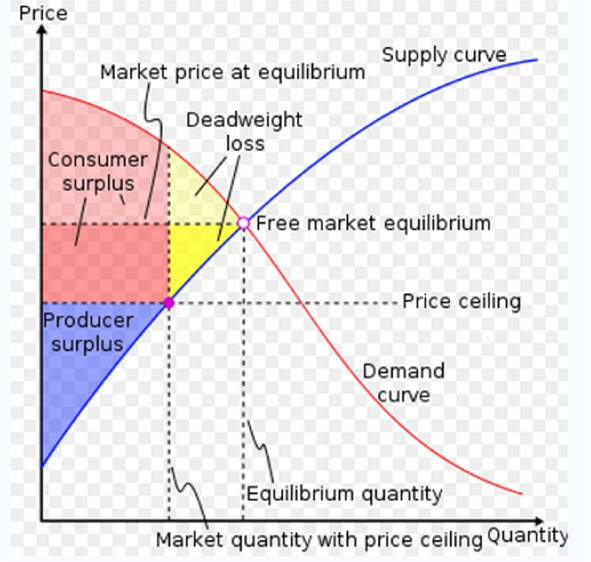 The producer surplus is the amount that producers benefit by selling at a market price mechanism that is higher than they would be willing to sell for. factors of production: in perfect competition, no producer surplus accrues to the individual firm. This is the same as saying that economic profit is driven to zero. Real-world businesses generally own or control some of their inputs, meaning that they receive the producer's surplus due to them: this is known as normal profit, and is a component of the firm's opportunity costs. If the markets for factors are perfectly competitive as well, producer surplus ultimately ends up as economic rent to the owners of scarce inputs such as land. On a standard supply and demand (S&D) diagram, consumer surplus (CS) is the triangular area above the price level and below the demand curve, since intramarginal consumers are paying less for the item than the maximum that they would pay. 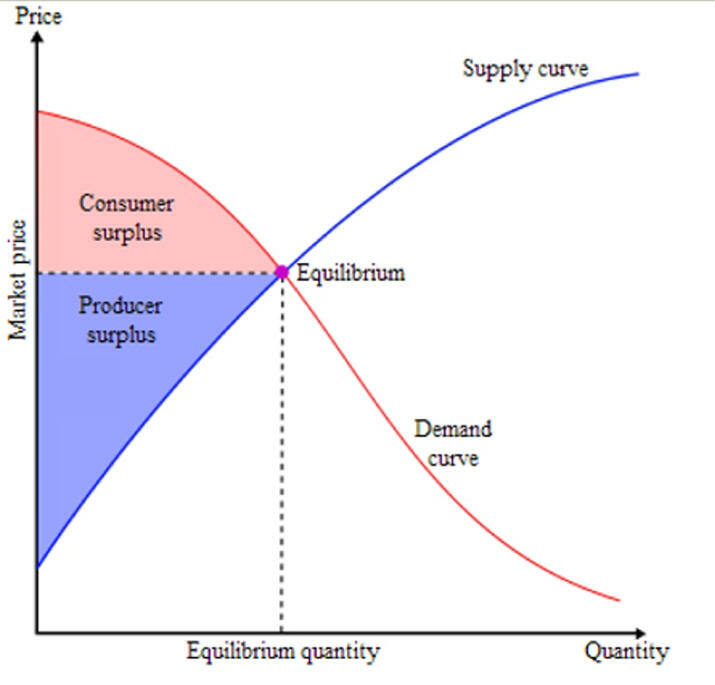 In contrary, producer surplus (PS) is the triangular area below the price level and above the supply curve, since that is the minimum quantity a producer can produce. If the government intervenes by implementing, for example, a tax or a subsidy, then the graph of supply and demand becomes more complicated and will also include an area that represents government surplus. Combined, the consumer surplus, the producer surplus, and the government surplus (if present) make up the social surplus or the total surplus. Total surplus is the primary measure used in welfare economics to evaluate the efficiency of a proposed policy. A basic technique of bargaining for both parties is to pretend that their surplus is less than it really is: sellers may argue that the price they ask hardly leaves them any profit, while customers may play down how eager they are to have the article. In national accounts, operating surplus is roughly equal to distributed and undistributed pre-tax profit income, net of depreciation. In some schools of heterodox economics, the economic surplus denotes the total income which the ruling class derives from its ownership of scarce factors of production, which is either reinvested or spent on consumption. In Marxian economics, the term surplus may also refer to surplus value, surplus product and surplus labor. purchase it for less than he is willing to pay. 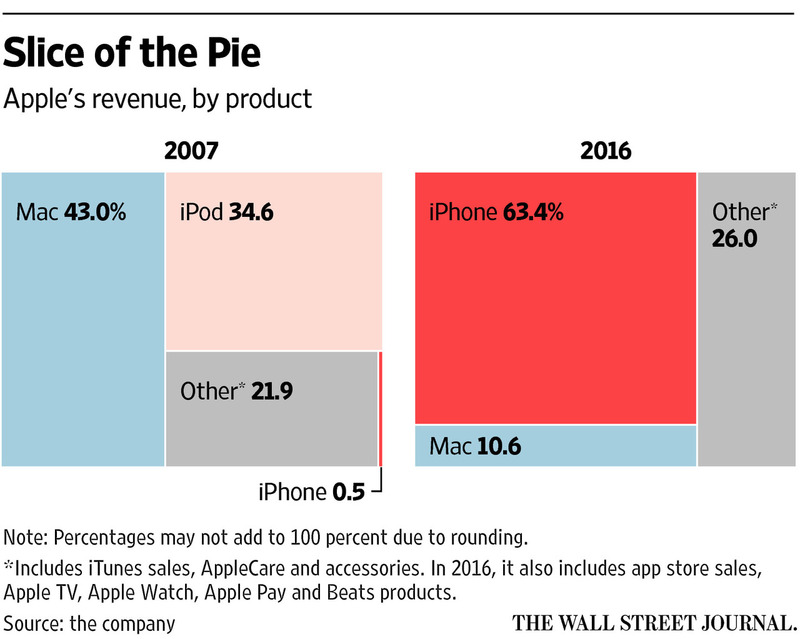 The difference between the two prices is the consumer surplus. 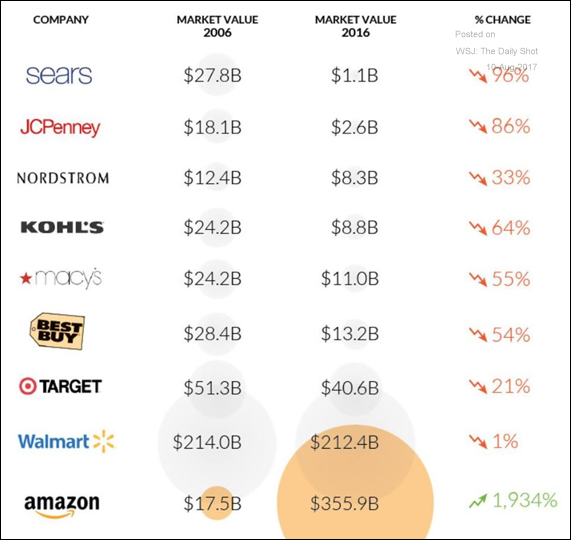 do not show up in the demand curve because they correspond to amounts the consumer does not buy, regardless of the price. For a given price the consumer buys the amount for which the consumer surplus is highest. One bargaining tactic is to pretend a lower consumer surplus. The aggregate consumers' surplus is the sum of the consumer's surplus for each individual consumer. This can be represented on the figure of the aggregate demand curve. The graph shows, that if we see a rise in the equilibrium price and a fall in the equilibrium quantity, then consumer surplus falls. When supply of a good expands, the price falls (assuming the demand curve is downward sloping) and consumer surplus increases. This benefits two groups of people. Consumers who were already willing to buy at the initial price benefit from a price reduction; also they may buy more and receive even more than at the initial price and also receive some consumer surplus. 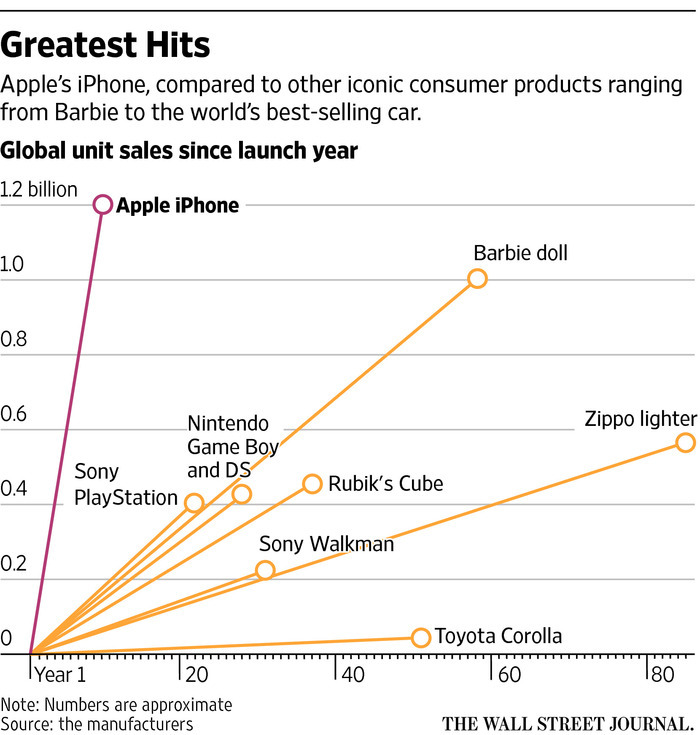 Consider an example of linear supply and demand curves. For an initial supply curve S0, consumer surplus is the triangle above the line formed by price P0 to the demand line (bounded on the left by the price axis and on the top by the demand line). If supply expands from S0 to S1, the consumers' surplus expands to the triangle above P1 and below the demand line (still bounded by the price axis). 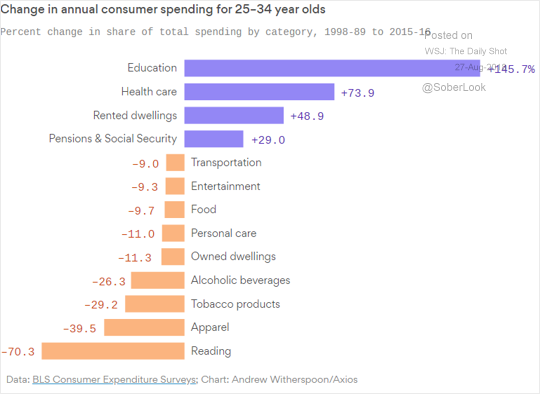 The change in consumer's surplus is difference in area between the two triangles, and that is the consumer welfare associated with expansion of supply. Some people were willing to pay the , the by P1, on the left by the price axis and on the right by line extending vertically upwards from Q0. The second set of beneficiaries are consumers who buy more, and new consumers, those who will pay the new lower price (P1) but not the higher price (P0). Their additional consumption makes up the difference between Q1 and Q0. Their consumer surplus is the triangle bounded on the left by the line extending vertically upwards from Q0, on the right and top by the demand line, and on the bottom by the line extending horizontally to the right from P1. willing and able to sell product to customers. 3. Inflation's Back, Trouble Ahead? B. With Inferior Goods, less as income rises. B Maintaining a Brand Not Easy. Free Stuff For Students is an extensive collection. Free Internet Libraries improve grades and careers.